AdWords has updated how phrase and exact match keywords are triggered! Let’s begin with a refresher on phrase and exact keyword match types. In exact match, your ad only shows when your keyword is typed exactly as you write it. For example, if you are bidding on the exact match of the term “red sox shirts” your ad will only show when searchers type this keyword exactly. In phrase match, there can be terms before or after the specific keyword. 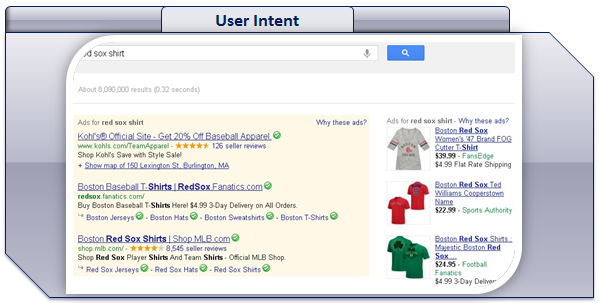 For example, a search for “men’s red sox shirts” or “red sox shirts large” would trigger your ad. Both of these match types help to better qualify your traffic. However, what happens when a searcher types in “red sox shirt” where the singular version instead of the plural version is used? Or what if the searcher misspells your keyword, typing in “red socks shirts” with a “ck” instead of an “x”? If you were just using phrase and exact match the answer is that your ads would not show. You would either have to put the singular, plural and misspelled versions into your ad groups or use broad or modified broad match. New updates to how these match types are triggered will give your phrase and exact match keywords greater exposure. Beginning in mid May, and even earlier in some accounts, phrase and exact match keywords will now focus more on user intent. Google estimates that at least 7%* of search queries contain a misspelling. Then there are the singular and plural versions of keywords. In most cases, if you are only bidding on the singular or plural version, your ad will now show with the alternative search. Additionally, people often search for a product using different names. Instead of searching “red sox shirts” the query might be “red sox tees.” These updates will allow your ads to show for keyword variations closely related to your terms while still being more targeted than broad match, and most likely more so than modified broad match. It is imperative that you closely review your search term reports to make sure these near phrase and near exact match queries are relevant. For example, a search for “red sox tanks” could very well trigger your ad based on the keyword “red sox shirts.” You would then need to add “tanks” as a negative keyword if you don’t sell Red Sox tanks. 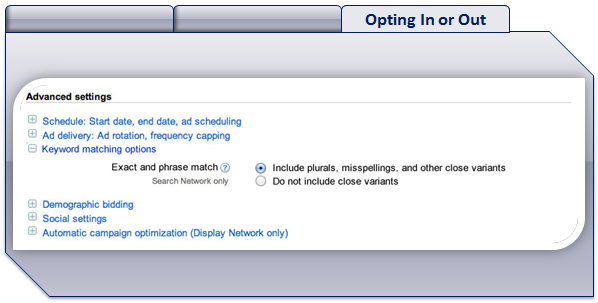 Also imperative to note is that most accounts are automatically opted into these new keyword matching options. These options are set at the campaign level and can be found in the “Advanced Settings” section of each individual campaigns’ “Settings” page. If you do not want these new keyword matching options you will need to check the “Do not include close variants” radio box. Overall, we are excited by these new match types, but will monitor closely. It is always good to get additional, relevant traffic, but there will undoubtedly be some weeding that will need to be conducted.